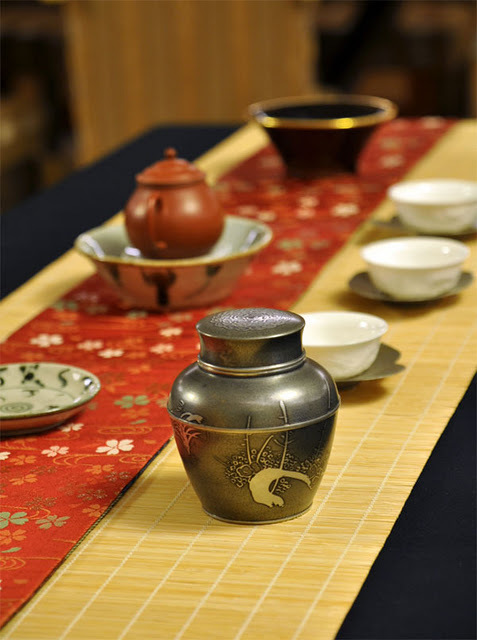 An exceptional tea celebrates the New Year and it requires exceptional accessories, a great set up and a slow gongfu brewing. 2 hours are dedicated to drinking just this tea. I let the leaves rest in a porcelain jar for a while. 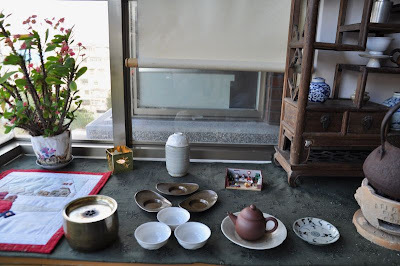 Then, I pick my smallest zhuni teapot, De Hua dragon cups, copper Cha Tuos with silver rim and a copper Shui Fang (kensui). For Christmas, I always purchase lily flowers to decorate our apartment. Now, they have blossomed and add a festive feeling to my Cha Xi. I could even find a matching scarf and use it as Cha Bu! 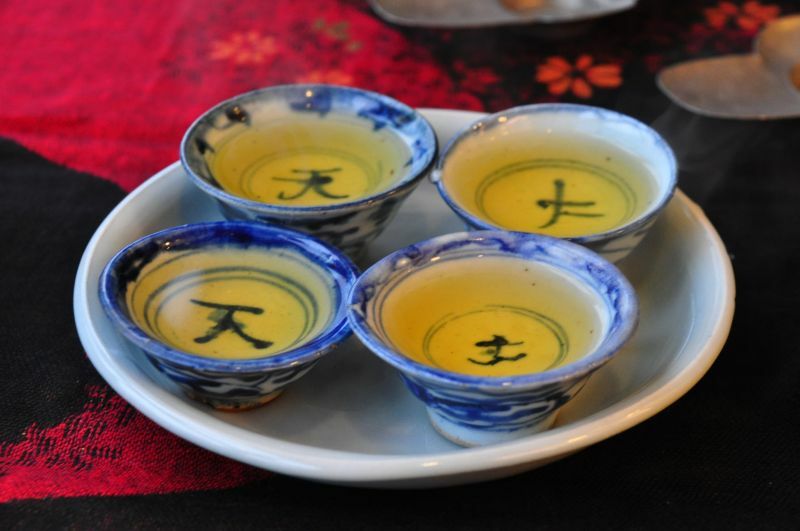 To evaluate dry Yan Cha, we can proceed with 2 breathings. First, we smell the roasting. Second, we smell to look for fragrances of lichen moss. 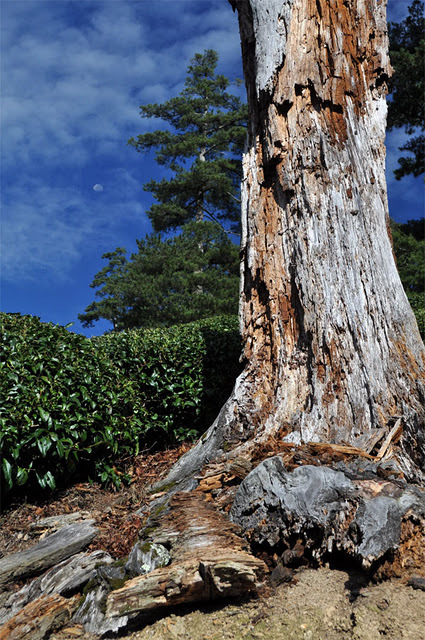 Yan Cha means rock tea for a reason: the trees grow between rocks and cliffs. Licken moss covers many rocks and their smell permeates real Yan Cha. I'm salivating just looking at this picture again! 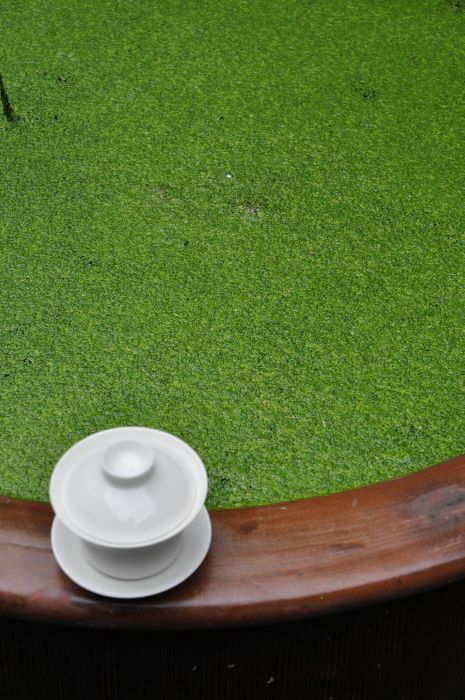 From the brown look of the tea soup, I should have expected a strong taste. So, except for a slightly dry feeling on the tongue, try to imagine a warm cup of sweet velvet that lightly flows down the throat instead! 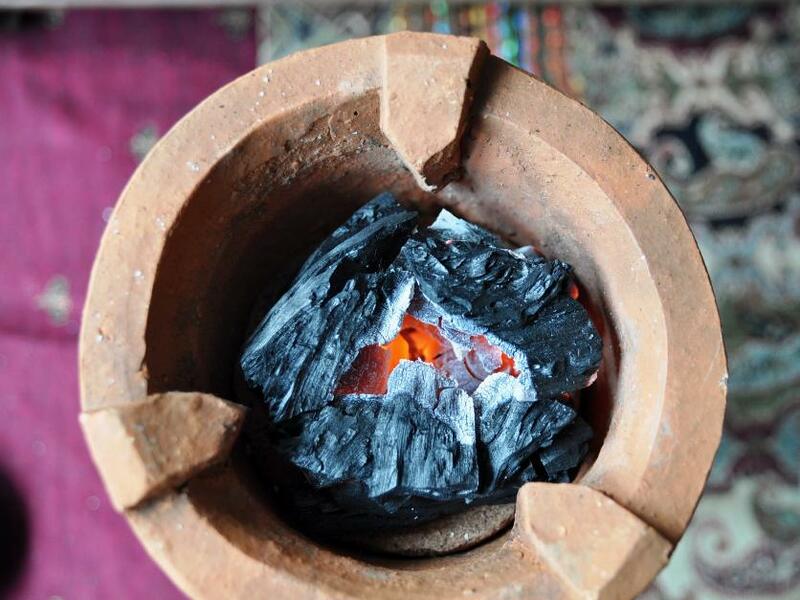 The charcoal fire has mellowed the spring water to perfection! Then, it hits you. The eyes open up, the spirits lighten and the whole body warms up! Its aftertaste lets your heart pound, as if you had just glimpsed at your sweetheart after a long separation. The wholeness of the fragrance is also special: the roast fragrances are not separated from the tea. 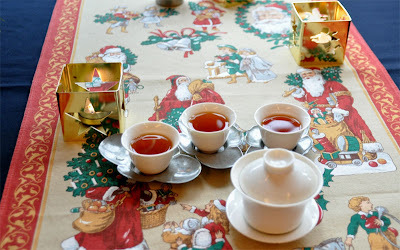 The darker roast notes so well complete the fresh tea fragrances that I don't know where one starts and the other stops. Later brews turn a little lighter in color, but still produce a very bright golden orange reflection. It shines in the cup as well as on the palate. The mouth remains so pure, clean and light! There's even a hint of minty freshness on the tongue. The body experiences warm and calm bliss! 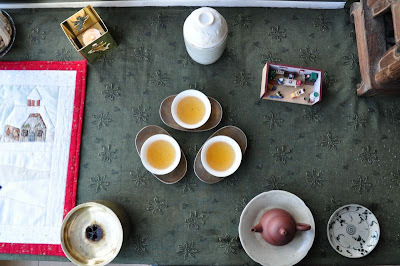 The only drawback of this kind of tea is its rarity, difficulty to find and price. (You won't find it in my selection ; I don't have enough for sale). But it serves as a bright star to guide us to understand what perfection tastes and feels like. The open leaves turn green again. The oxidation marks are easy to see on the rims of the leaf. 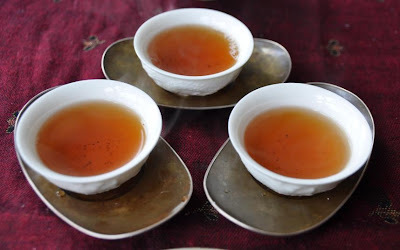 (This level of oxidation is similar to that of my current concubine Oolongs and Feng Huang Hung Shui Oolongs.) 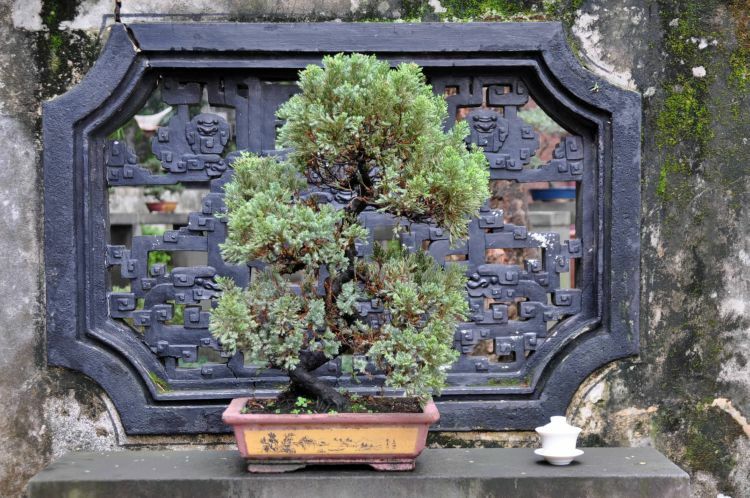 The leaves are strong and retain some elasticity. 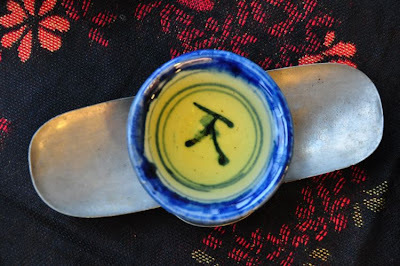 Thanks to David Louveau, I have this small qingbai ever that I use to refill the tetsubin with spring water. 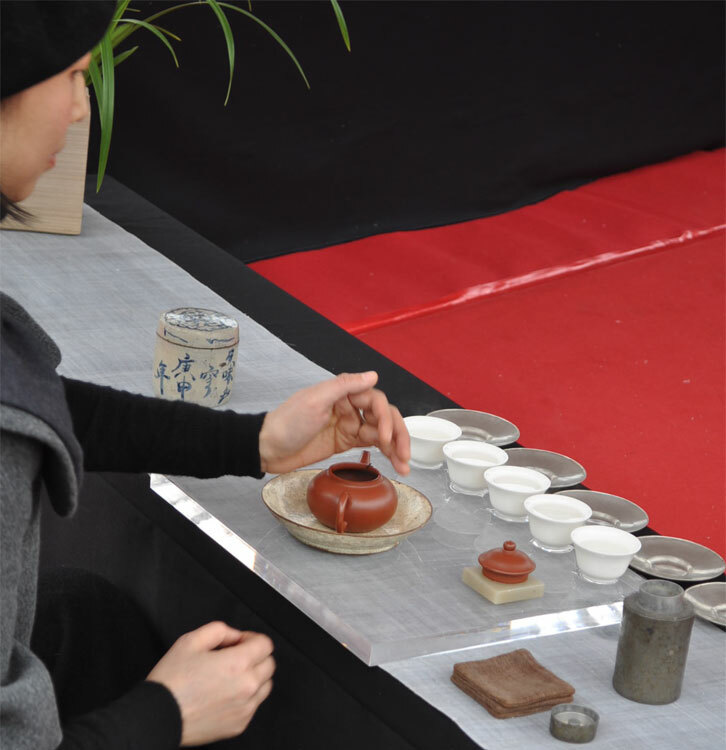 During this kind of ceremonious Cha Xi, it adds considerable elegance. (At this stage, a plastic bottle would utterly ruin the mood). 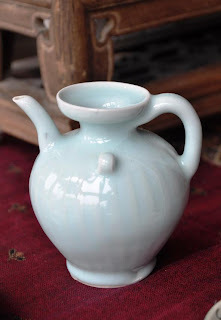 The narrow long spout creates a small, but precise flow. It takes more time to empty, but it reminds you to take it easy. There's no haste. Enjoy the sight of this fresh water spring! The double glazing of this ever makes it very smooth to touch. The walls are thick and it's quite heavy for its small size, especially once filled with water. 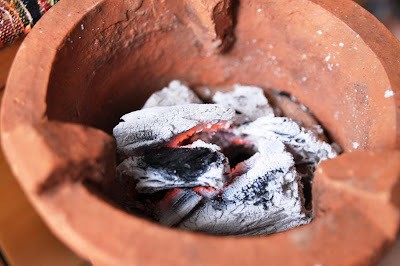 The charcoal is nearly consumed by now. 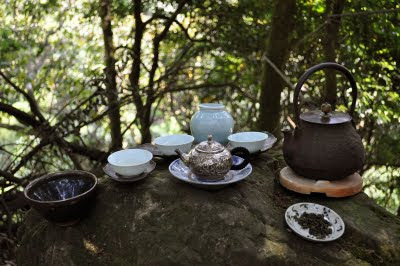 I say goodbye to this tea, but I will continue brewing these leaves the next days. There's still a lot of natural sweetness that can be coaxed out of them. Cette année 2011 fut riche en rencontres. 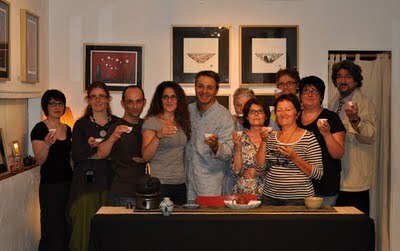 Geneviève du blog Tpots, Scott Hoyt directeur de film, Jason Walker, Hugo de Camellia Sinensis, Jason Cohen et l'Institut de thé de Penn State, Nikosan, David Louveau, Lucas, de nombreux fans de thé des USA, de France et de Belgique... Et c'est sans compter tous les Taiwanais avec qui je partage régulièrement de bonnes coupes! La même passion du thé nous anime. 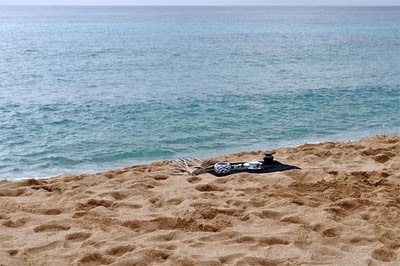 Et je suis heureux de pouvoir contribuer avec les images et les articles de mon blog à une meilleure compréhension et appréciation de ce doux et bienfaisant breuvage. Le thé, universel, nous réunit, moderne, il stimule notre créativité, et, apaisant, nous reconnecte à la nature. Cliquez sur ces liens pour les 12 images de 2010, 2009 , 2008 et 2007. 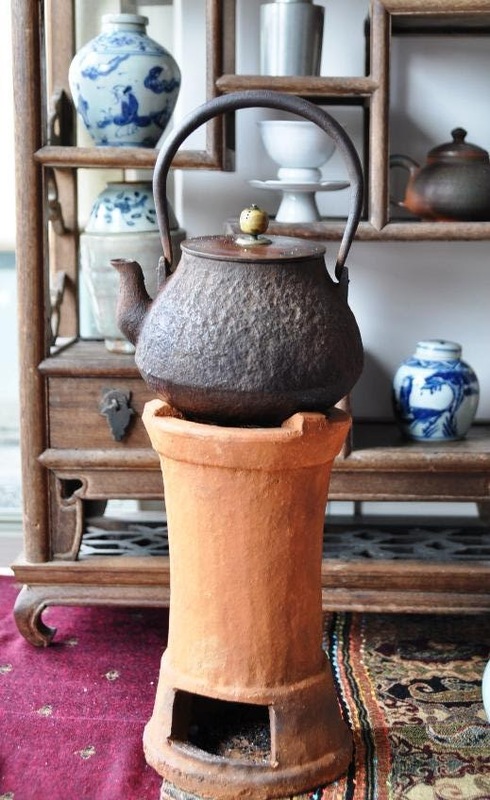 10 : The tea jar 'magic trick' - Oolongs can improve with age under the right conditions. 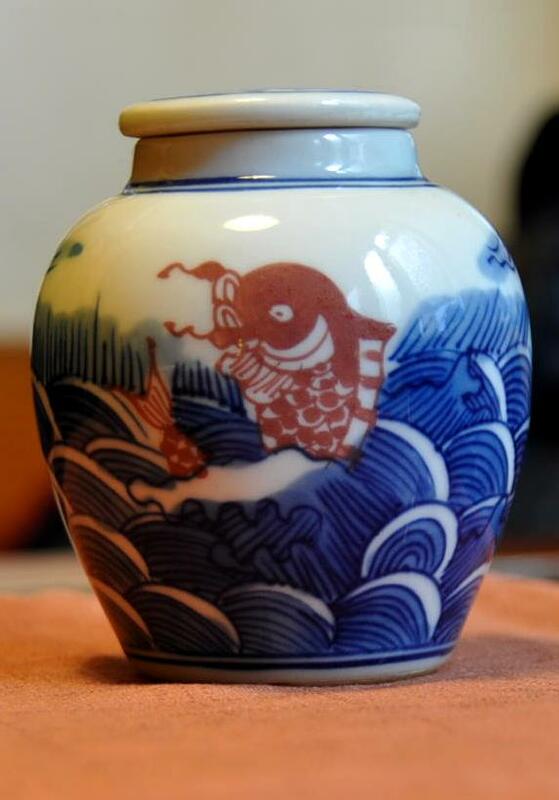 But did you also know that the transformation can be almost immediate if you use a good porcelain jar? 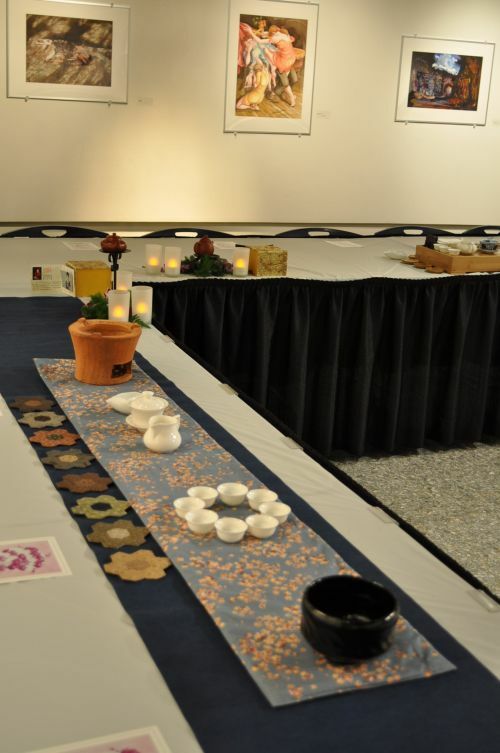 9 : Taiwan Tea at Penn State's Robeson Gallery - Tea Masters in the USA! 18 years after graduating from university in Pennsylvania, I had the chance to brew tea with serious tea students at Penn State! 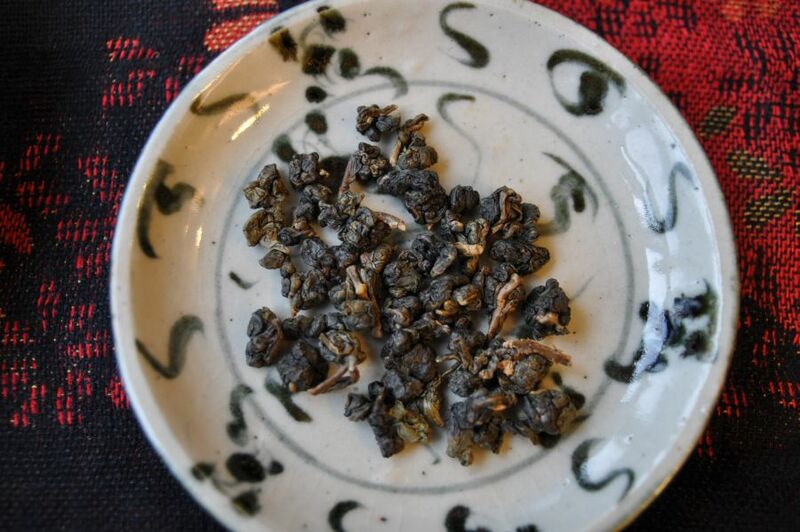 8 : 2011 Spring Jade Oolong from Yi Guang Shan - Cui Yu, Tsui Yu or jade Oolong. 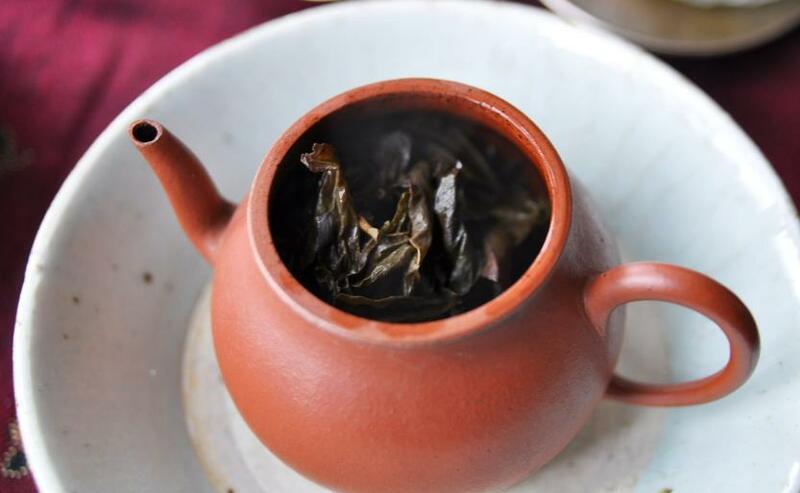 This very green and fragrant Oolong cultivar has been developed in Taiwan. 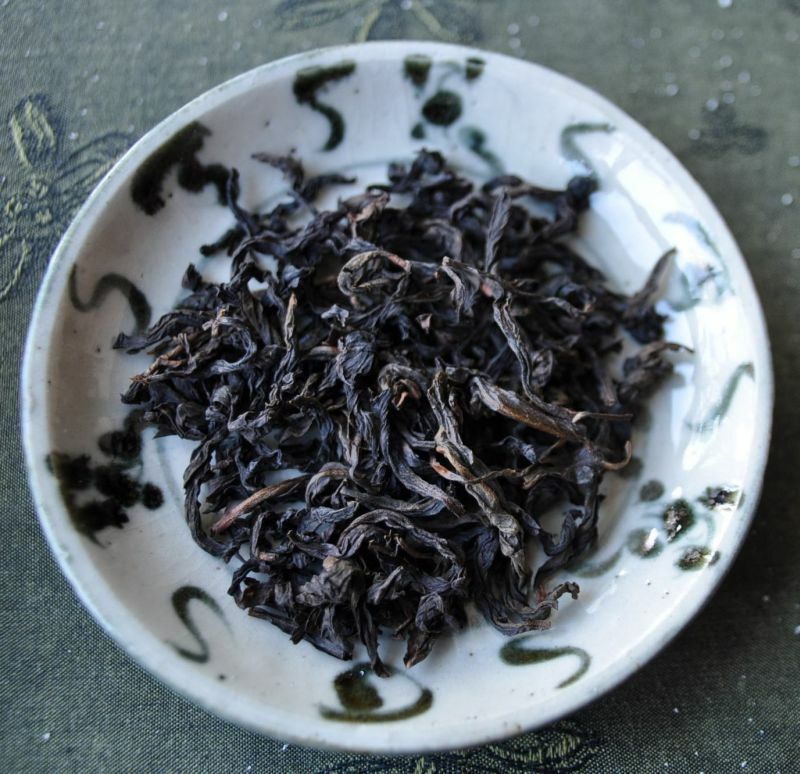 7: Oolong Concubine 'sauvage' de Feng Huang de l'hiver 2010 - Récolté dans une plantation abandonnée de la région de Dong Ding et torréfié traditionnellement. Le plus 'Wu Yi' des Oolongs de Taiwan. 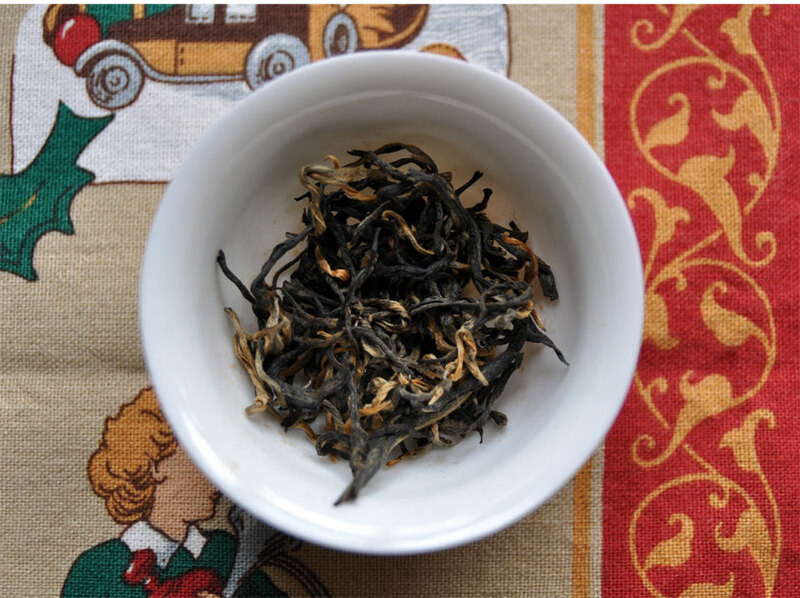 6 : Qi Lai High Mountain Oolong (2200 m) - Da Yu Ling and Li Shan have been hit by a rainy season twice this year (spring and winter). Luckily, I could get my hands on an early and dry harvest of this Qi Lai mountain Oolong. 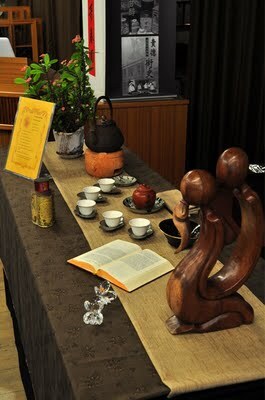 5 : Wu Yi Tea Documentary - CCTV introduces Wu Yi with 5 documentaries translated in English and French! 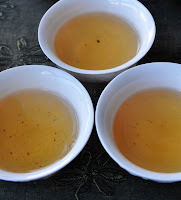 4 : Gao Shan Ali Shan Oolong from Spring 2011 - A mountain Cha Xi with 2 American visitors for one of my best spring Oolongs! 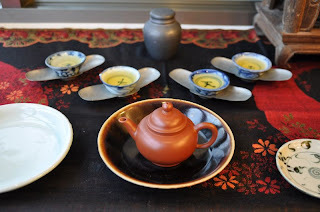 3 : 'Subtropical forest' Wenshan Baozhong - A tasting of my classic Wenshan Baozhong. 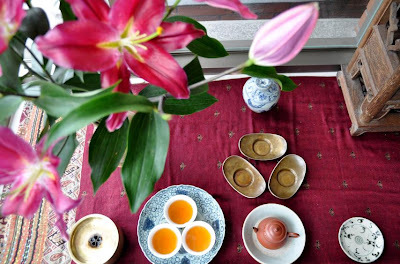 2 : A new, finer 'lotus' qingbai porcelain by David Louveau de la Guigneraye - The Sung and Yuan dynasty inspire me and David Louveau to design an elegant tea set. 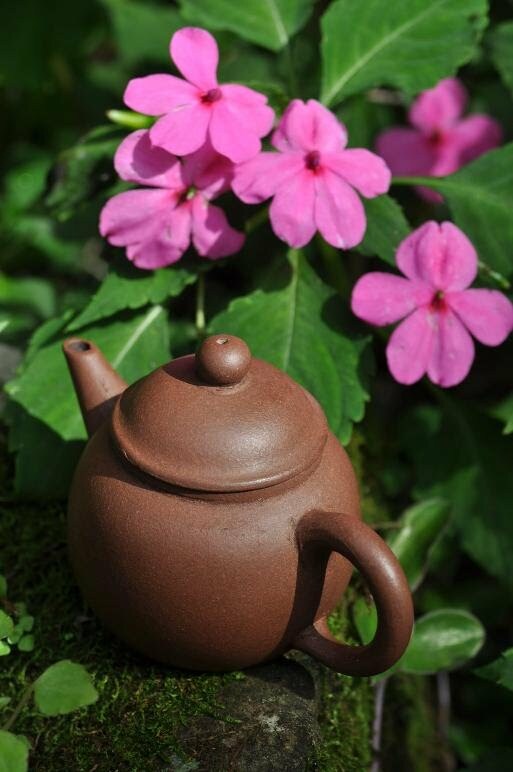 1 : 3 Yixing Xishi teapots are back! - The name of a Chinese Beauty for the most feminine teapot. This article overwhelmed all the others. The zhuni Xishi version is now gone, but luckily the zisha Cha Ren Ya Xin version is still available! Je trouve justement une similarité étonnante entre le Da Ye et les Bai Hao. Tant que j'y ai consacré la même théière Zhu ni. Les origines Oolong de ce thé sont bien perceptibles en bouche, voir même sublimées par l’oxydation... 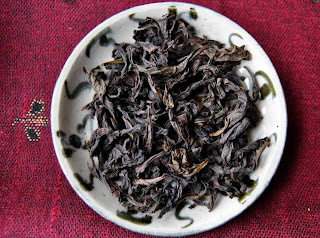 Le résultat est plus délicat que les thés rouge du Yunnan que j'affectionne beaucoup. Une expérience agréable et originale à renouveler. " 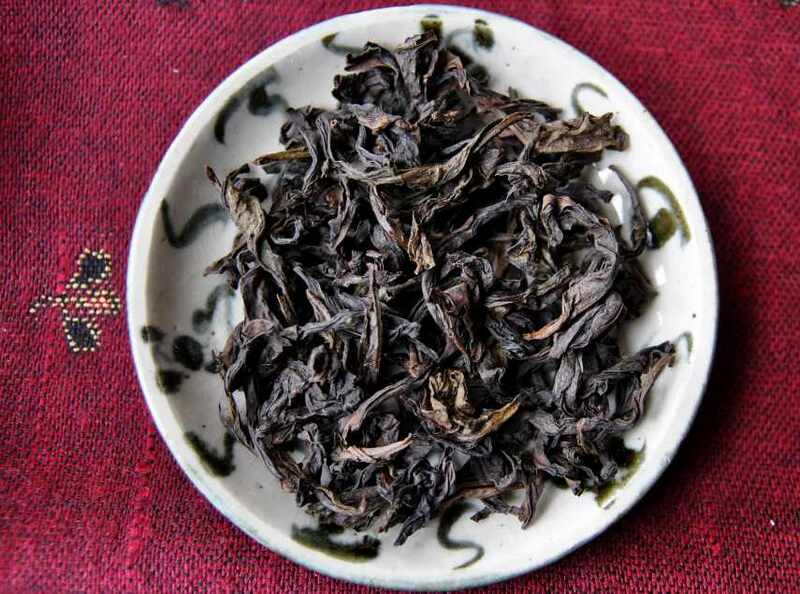 Coming from Ali Shan, this is one of my darkest Hung Shui Oolong. 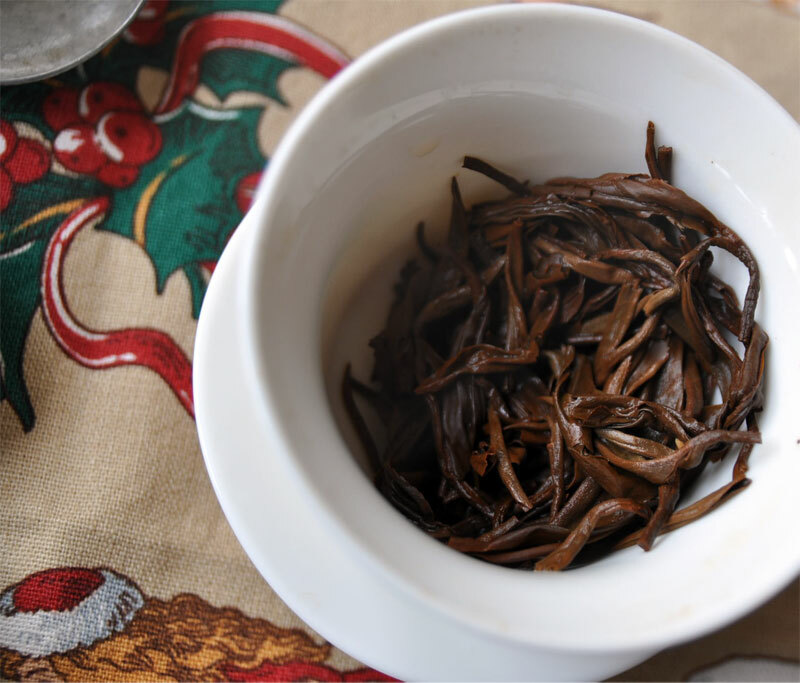 These leaves are a real challenge to brew well. Rolled very tightly, they require a great amount of force to open up. But pushed too strongly, roasting flavors come out and overshadow the brew. The solution is to start with a strong pour of boiling water for the first brew and very slow pours for the next. 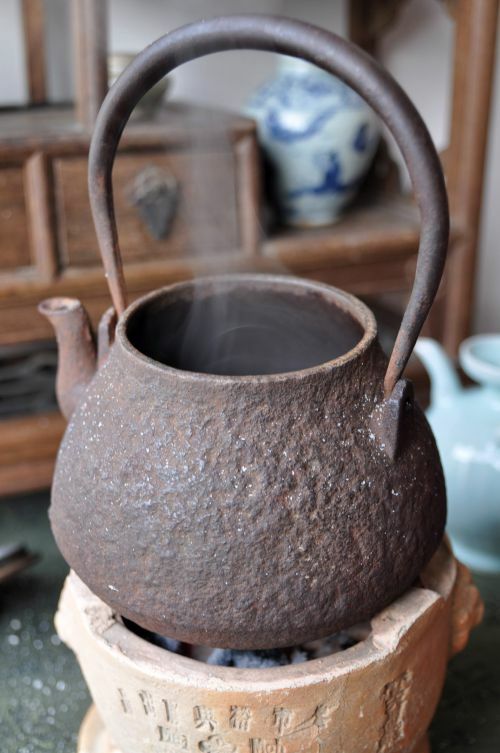 It helps that, with time, the roasting flavors diminish, especially if the tea is kept in a porcelain jar or a pewter caddy. Also with experience, we gain a better understanding of these leaves and learn how to brew them well. The reward is an extraordinary sweet, malty and rich cup of tea. A warm Cognac almost comes to mind! The caramel fragrances are clean and pure. This tea shines and warms. 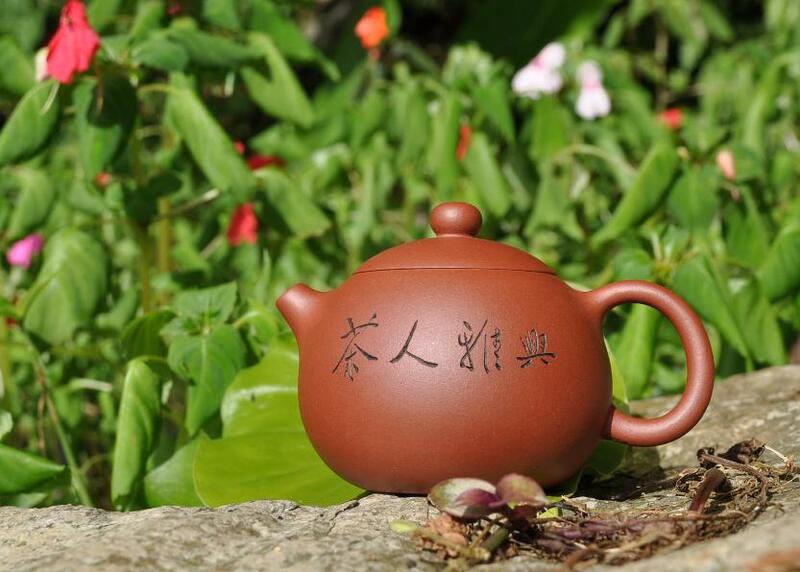 A zhuni pot with a high pitched sound retains the heat best and is able to extract all the flavors. 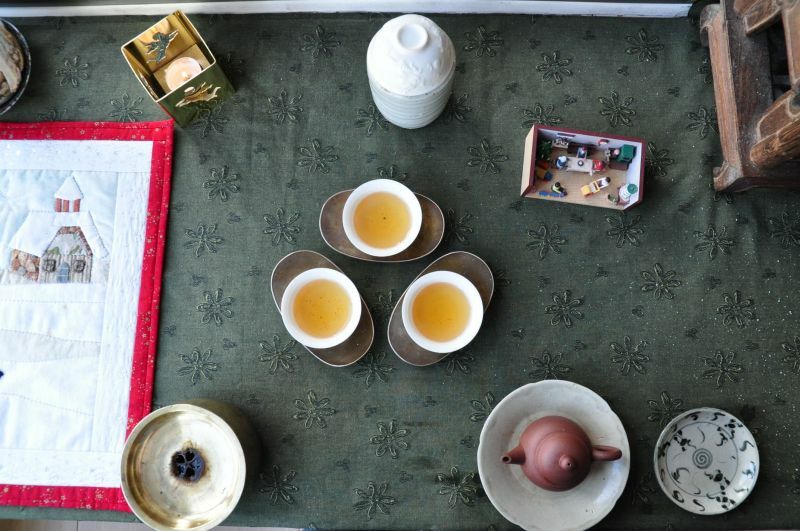 Today's Cha Bu is a scarf matching the character of this Oolong. 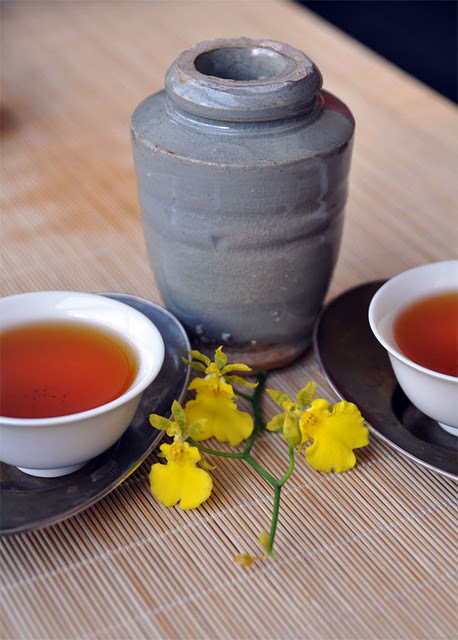 I add a plate to avoid spilling water on it while pouring tea into the cups. And, of course, I also use pewter Cha Tuo from Japan under each cup. Rien de tel qu'un Oolong torréfié et plein de chaleur pour débuter l'hiver! 5 torréfactions longues et lentes en septembre 2011 (au four électrique). 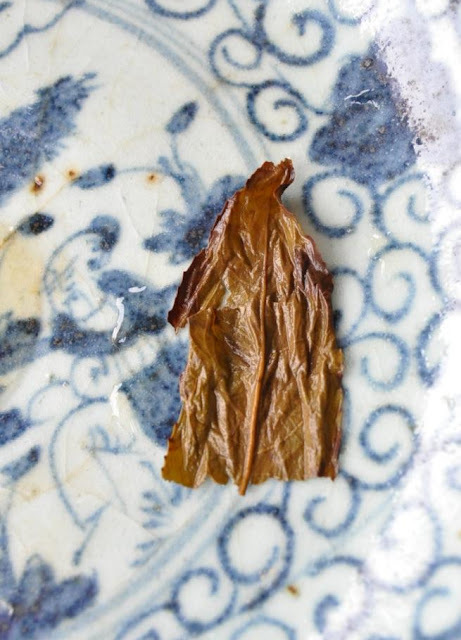 Ces feuilles sont menues et fines, mais on pourrait presque les prendre pour des feuilles d'Oolong de Wu Yi (Fujian). L'altitude est semblable aussi: dans les 2 cas, il s'agit de petits monts inférieurs à 1000 metres. L'odeur est boisée, un peu anisée aussi. On obtient des odeurs trs différentes selon qu'on hume la jarre contenant le thé ou bien les feuilles directement. Celles-ci ont les fragrances les plus fortes et les plus sombres. Elles me rappellent celles d'une ferme! Mais dans la jarre, on ressent bien plus de finesse et de sucré. L'infusion prend une couleur jaune/orange foncée avec une bonne transparence. Au nez, cette infusion fait penser à une fort sombre, masculine et de la réglisse! En bouche, malgré un dosage assez puissant, le goût reste relativement doux et moelleux longtemps. Sur la fin, on sent une fraicheur sous-jacente. Chaque terroir influe et change le thé. Le même cultivar a des goûts différents selon qu'il vient de Dong Ding, Shan Lin Shi ou du Wenshan. Ici, c'est surtout la foret 'masculine' que je ressens. Les feuilles s'ouvrent bien et redeviennent vertes. Un peu fripées, elles sont allées à la limite de la torréfaction sans carboniser. (Ce Top Qizhong est plus torréfié que le Qizhong de 2009). 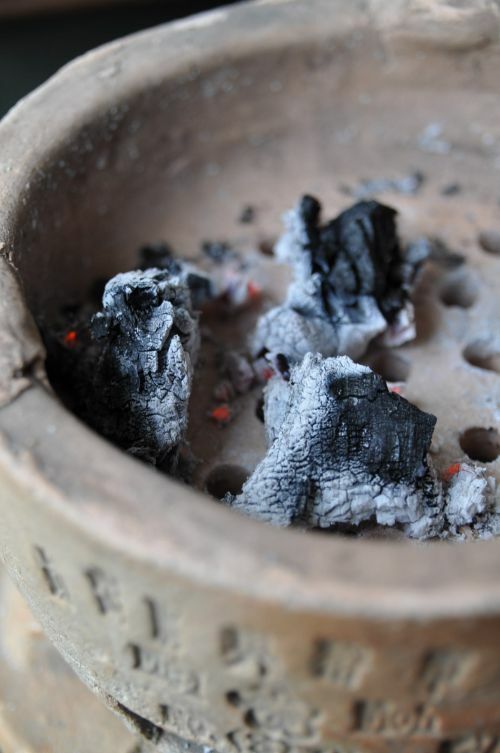 Pour encore mieux mieux me réchauffer, j'ai bouilli mon eau avec du charbon de bois! La chaleur du feu est si réconfortante dans mon appartement non chauffé. Le temps se ralentit. Je souffle sur les braises pour l'accélérer un peu. Des cendres blanches se répandent sur mon Cha Xi. C'est comme s'il neigeait! L'eau chaude ainsi chauffée est meilleure, plus ronde et plus 'épaisse', que d'habitude. A la fin du Cha Xi, je sèche ma tetsubin pour qu'elle ne rouille pas. 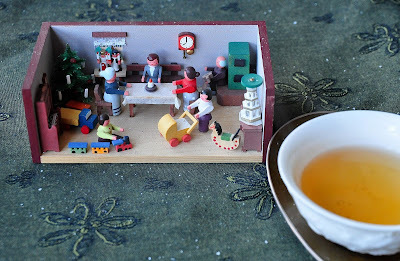 Ces figures en bois du Erzgebirge (Allemagne) me rappellent l'ambiance de l'attente de Noël et ajoutent leur joie à mon thé! 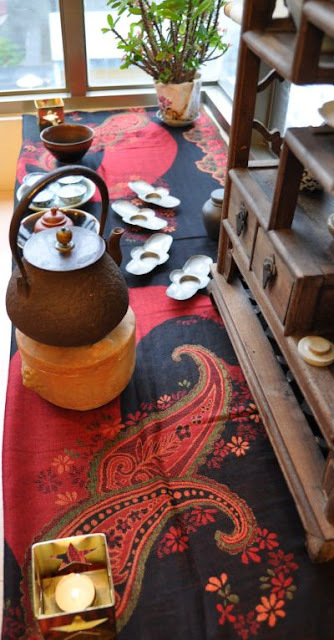 Maybe you're wondering why one would want to impress a tea merchant/farmer/lover? It's not for vain glory or for showing off. 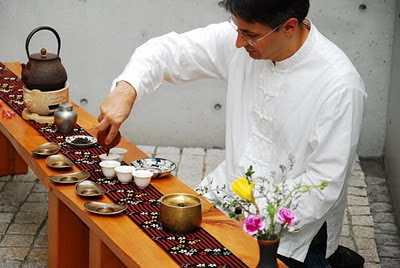 When you meet an experienced tea person, you want to connect with him and, hopefully, get the opportunity to drink some of his better teas. The more you impress, the more likely to get treated with really top quality leaves. Motivation and interest matter a lot. This is one reason, for instance, why it's not so easy to order from my selection. I only want to provide my good teas to people who are really interested in tea and take the time to browse through my blog. 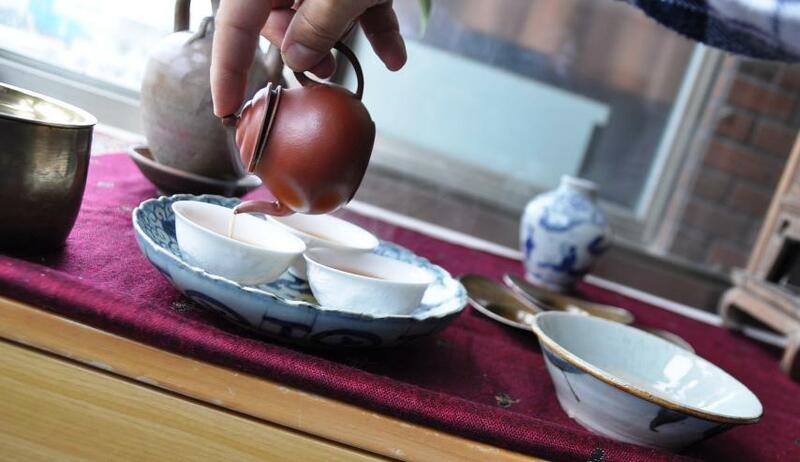 Bragging about the teas you usually drink or the money you spend on tea/teaware is not the way to go. First, what you can do is show that you come with your own professional tea accessory: a porcelain Chinese soup spoon. (I must have posted about this long time ago already. 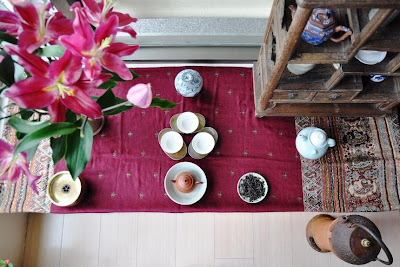 I got it from one of my first classes with Teaparker). A variation would be to insist on using a porcelain gaiwan (or a competition set) to brew tea. 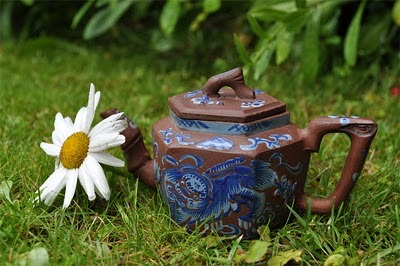 (Later, if you do get the 'pro' to share some of his rarest leaves that are not for sale, you'll happily agree on using a teapot). Often there will be 'tests'. A tea is poured in your cup and you're asked to say a word about it. Yesterday, I was impressed when my guest recognized that the puerh I served him came from Lincang. 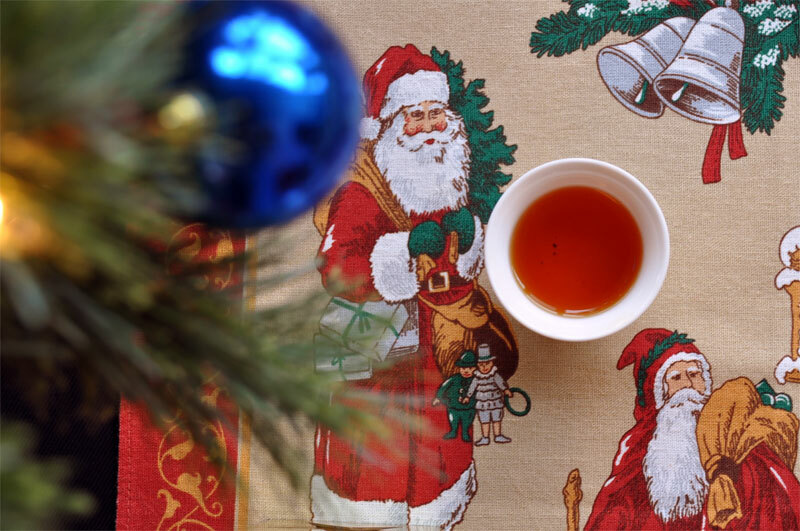 And I think he was pleasantly surprised, too, when I told him that the puerh he had brought tastes like Yiwu (as it came from Yiwu). The answer to such questions shows your level of tea expertise. If you can't precisely tell the region, then you can broaden your answer and give a more detailed account of your tasting. If your description matches the tea well and you show that you appreciate the tea's quality's and/or recognize its shortcomings, then you'll earn respect. 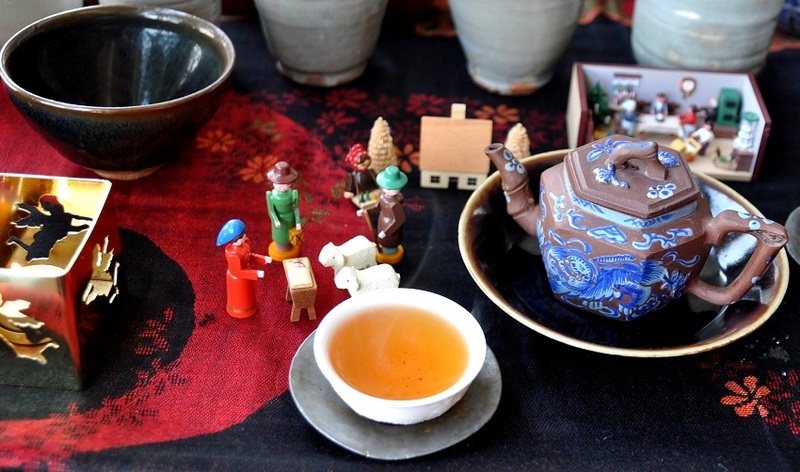 When you're making a new tea friend and you hope to drink some of his best tea, it seems also logical that you would be willing to share some of your own best leaves. This is always a touching gesture. 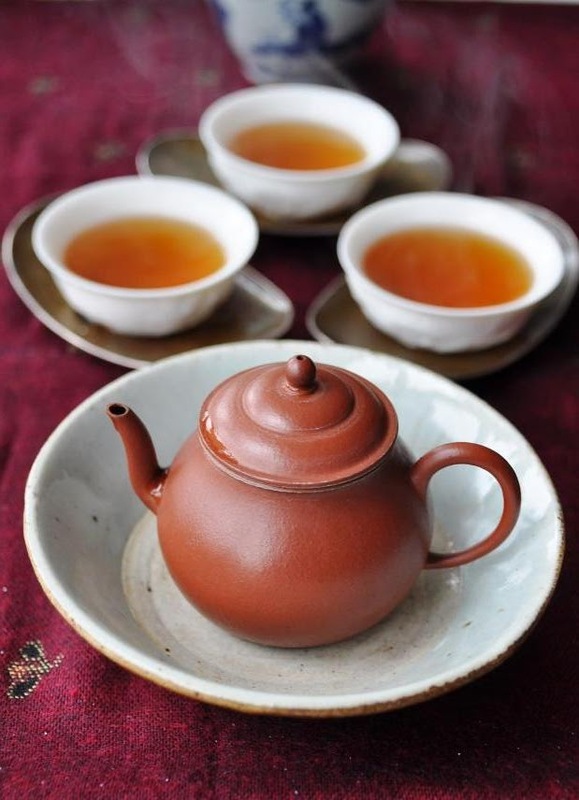 And it could lead to some healthy 'competition', where the other tea fan will try to find a tea to top yours. Some special leaves can be real door openers. Maybe you'll get the opportunity to brew your tea yourself. A good brewing technique and a good result will earn you additional points. 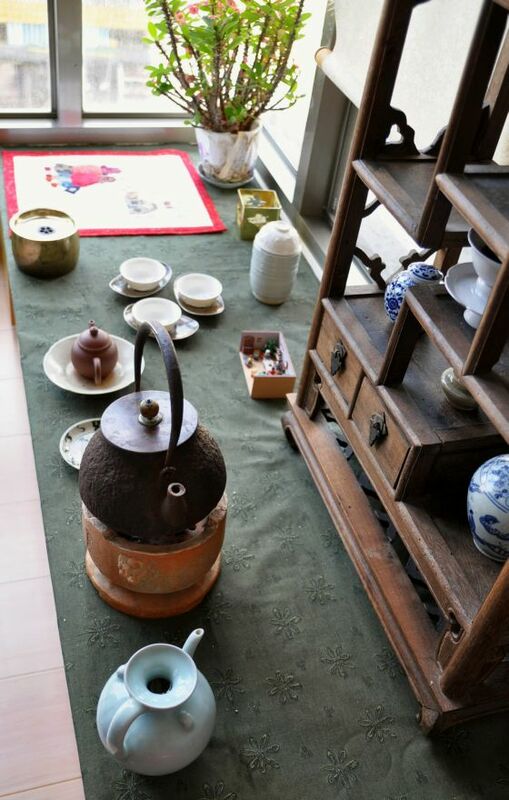 Some tea fans can also be impressed with special accessories: an antique cup, a zhuni or a silver teapot, a handmade pottery... 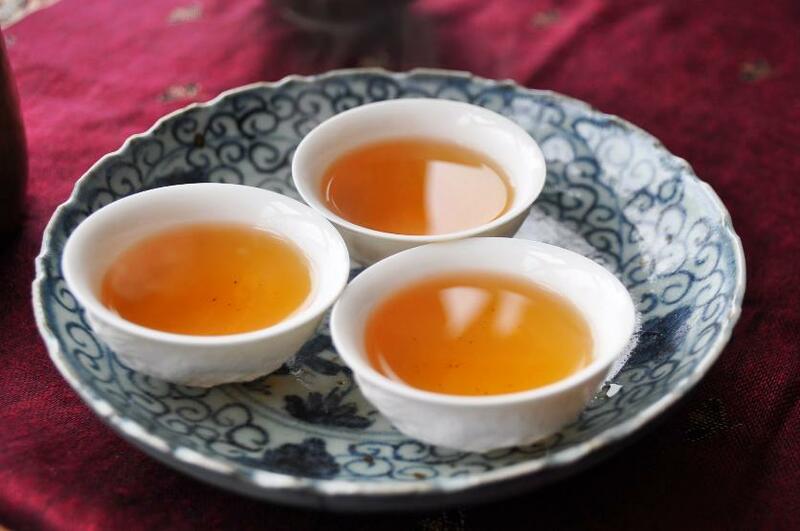 But, here again, it's not the mere possession of the item that will impress most, it's your intimate knowledge about it and understanding how (well) it interacts with a particular tea. Noël est la fête de la lumière dans l'obscurité. Au coeur de l'hiver, quand tout semble sombre et froid, la naissance de Jésus est un espoir et une joie. La lumière est le symbole de la présence divine parmi nous. On ne peut la toucher ou la comprendre, mais on peut la voir avec son coeur, sa foi, et dans les yeux de ses enfants le soir de Noël. Ces bourgeons dorés et ces longues feuilles noires nous dévoilent l'identité de mon thé favori pour les fêtes de fin d'année: mon Dian Hong réalisé avec des feuilles de théiers puerh sauvages et centenaires. Ses odeurs intenses et fines sont sucrées et chaleureuses. 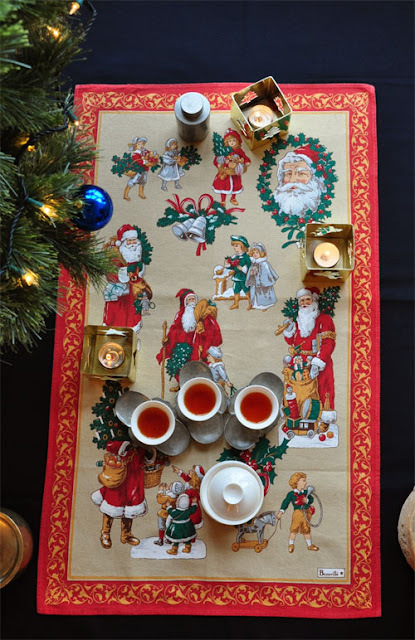 Chocolat au lait avec un soupçon de cannelle et léger arôme de fruits secs: on retrouve une grande affinités avec les saveurs des desserts des fêtes de la nativité. Aussi, il n'est pas étonnant qu'il accompagne si bien toutes ces gourmandises. De plus, comme tous les thés rouges (à oxydation complète), il a pour essence d'apporter de la chaleur au corps (contrairement aux thés verts qui apportent beaucoup de fraicheur). 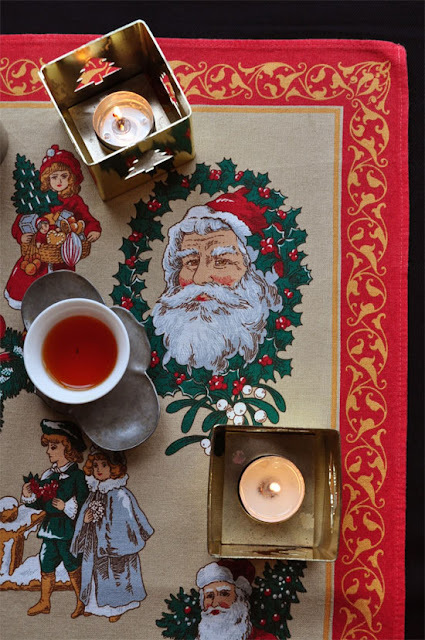 L'hiver est donc la saison idéale pour consommer du thé rouge pour se réchauffer. 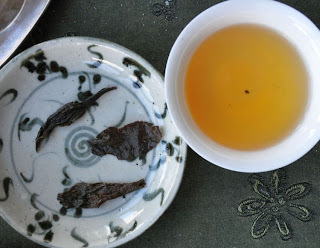 La particularité de ce Dian Hung est de combiner la force naturelle de ses feuilles de puerh avec la finesse et la chaleur de bourgeons transformés en thé rouge. Outre la pureté de ses fragrances, c'est surtout au goût que ce Dian Hung me surprend et me fascine. Sa liqueur rouge foncée annonce une forte concentration d'arômes. Mais l'entrée en bouche et le glissement dans la gorge se fait dans la plus grande légerté. Le palais est comme recouvert d'une couche d'huiles essentielles. L'arrière goût laissé en bouche est sucré et puissant. Le qi de ce thé agit avec force. Une chaleur et un bien-être se dégagent à partir du ventre. Les yeux semblent voir plus clairement. La bouche est le théâtre de ces contradictions: elle reste clean, pur et même fraiche, mais en même temps, la force de ces feuilles s'y ressent intensément. C'en est presque miraculeux! C'est un peu comme la lumière et la présence de Noël: le goût de ce thé semble se manifester par-delà nos 5 sens! 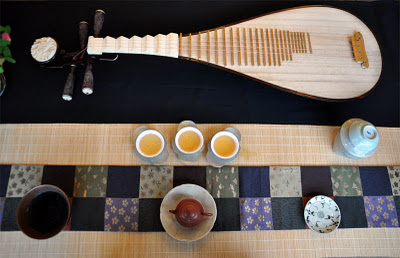 En cela, l'expérience de ce Dian Hung est semblable à celle que j'ai pu faire avec les meilleurs thés: le goût du thé est si fin qu'on le remarque à peine au départ, mais c'est tout le corps qui le ressent et absorbe l'énergie de la montagne d'où proviennent ces feuilles.